Epocrates for webOS Imminent. Update: It's Here! We've heard through the grapevine that Epocrates is coming to webOS and apparently it won't be too long until it lands. The company has a sign-up form where you can get notified when it's available - "early 2010" they say. The app is actually out in a beta to a small group of testers. 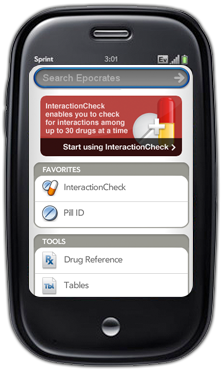 Some have publicly commented in our forums that the app is "FAST," while anonymously we hear that the app will include the standard Epocrates features plus Med Math, Interactions, their pill finder, and plenty of tables. The app, as you can see at right, also follows the webOS ethic of "just start typing" to search everything. Since webOS can, you know, fully multitask, medical professionals will be able to leave the app open in the background (where we're told it doesn't appear to consume much in the way of resources) to give it faster access than what is available on the iPhone platform. Mullrat in our forums says that an Epocrates rep said the app was submitted to Palm for approval - so all we need do now is wait. Luckily webOS users have plenty of practice in that regard. Update: Wahey! It's in the App Catalog, listed for free, and it's nearly 33 megs of medical goodness. Get downloading! Thanks @elbaso!